There is a lot of activity taking place in the project area right now. 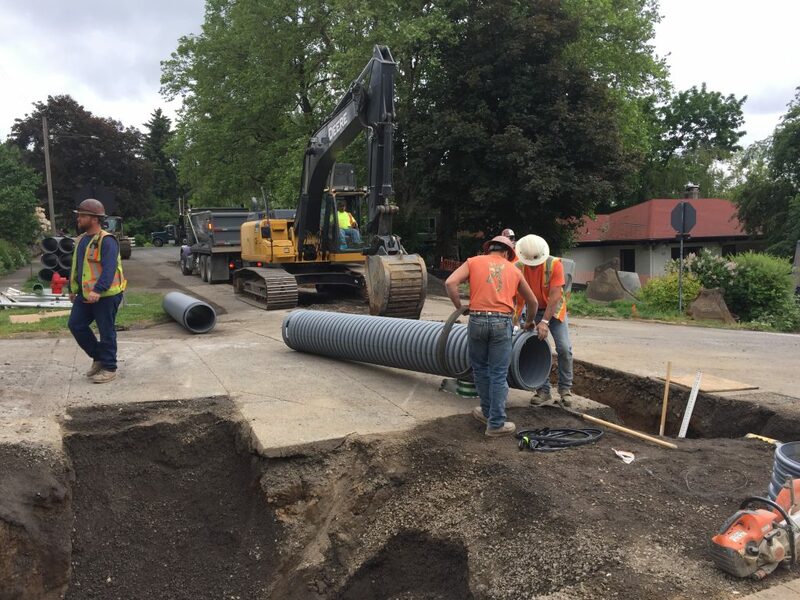 Emery and Sons Construction Group (Emery) is now working on installing storm lines on 7th Street and D Avenue, and a water line on 1st Street. NW Natural is also working in multiple block segments on D Avenue to relocate their gas main. Safety is by far our first priority. This is an important reminder to vehicular traffic, pedestrians, bicyclists and neighbors: please avoid accessing the active work zones and closed areas during work hours. Construction sites are busy places with lots of moving equipment, open trenches and deliveries of materials. Please use another side street or alley to get to your destination, and abide by the traffic control signage. This is to maintain the safety of all. Crews have started removing some trees, shrubs and brush located in the work zones. This work is now expected to continue for another two weeks. During this time, crews will also trim tree branches that are overhanging into the right-of-way in areas where the contractor needs additional clearance. NW Natural Gas is now working on relocating their gas main on D Avenue between 1st and 3rd Streets. This relocation has been slower than originally anticipated. As a result, Emery continues to shift their work plan, as most of NW Natural’s relocation work needs to be completed before the major road reconstruction work can take place along D Avenue. Last night, Crew 1 finished installing the storm line on 1st Street between D and E Avenues (pictured below). 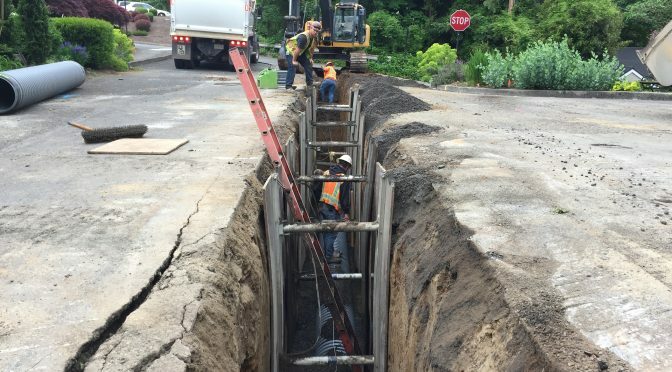 The intersection at E Avenue and 1st Street is now back open, but 1st Street will remain closed between D and E Avenues as a third crew will be working to install the water line. This work is expected to continue for another two weeks. There will be some minor anticipated water service interruptions (temporary shut-offs for 1 hour approx.). These will take place on 1st Street when crews switch over the water services to the new line. Impacted neighbors will be notified in advance via a door hanger. Today, Crew 1 is moving to the corner of 7th Street and B Avenue to begin installing the storm line on 7th. The intersection at B and 7th remains open, but the road is closed on 7th Street between B and C Avenues. This work will progress north towards D Avenue over the next few weeks. Crew 2 is making good progress installing the storm line on D Avenue. They moved across the intersection of 5th Street yesterday, and are now working between 5th and 6th Streets. This one block is closed to through traffic during work hours. 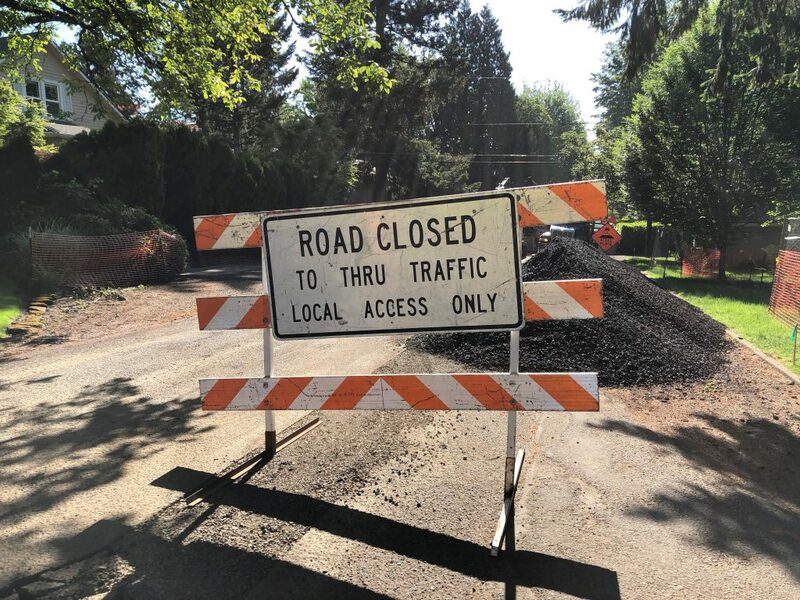 Crew 2 expects to be at the intersection of D Avenue and 7th Street by the end of next week, and will continue working west towards 10th through mid-June with rolling temporary road closures. Allowed work hours are 7 a.m. – 6 p.m. Monday to Friday. In observance of Memorial Day, there will be no work on Monday, May 28. As noted, construction schedules change frequently. We will strive to keep residents informed through these regular updates.